Modern buyers are well-informed and they conduct most of the research much before they connect with the salesperson. The salespeople today need to know ‘who’ their buyers are so they can add value to the buyer’s journey and help them finalize the purchase decision. The modern sales process has brought about a whole lot of difference in the way inbound salespeople should sell as compared to the legacy salespeople. Inbound Sales is about changing the way our sales teams sell in order to be in alignment with today’s empowered buyer. It’s about figuring out who the buyers are, what they are searching for, and how you can add value to their journey. This is how sales teams can be successful in the modern age. 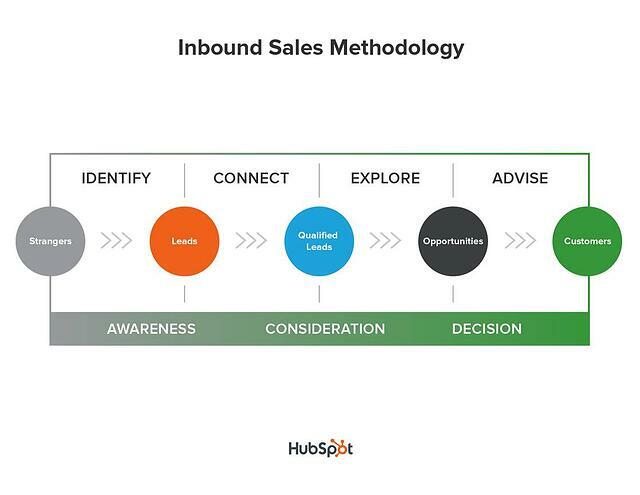 Let’s study the four stages of the inbound sales methodology for converting strangers to customers by adding value to their journey. Identifying your buyers is the first phase of the inbound sales methodology and is relatively easy. You just need to know who visited your website, filled out a form, or opened an email. You can do this by setting up sales workflows that’ll alert your sales team about these activities. In inbound sales, only relevant content should be used as a conversation point with the target accounts. No cold calls and emails. Consistent blogging and a visible presence on social media platforms are the ways to increase your connect with your potential buyers. Always connect with a personalized message and say no to generics. This will help you build trust and authority. What are their hobbies, business issues or challenges? What questions are they asking or have answered? What are the trends in their market/industry (if any)? What pages have they seen on your website? What content have they downloaded from your site? Next what you have to do is leverage the buyer’s initial interest to develop additional trust through exploratory conversations. The explore phase is all about leveraging information gathered during the Identify and Connect stages to determine whether this person is a good fit or a bad fit customer. If it’s a good fit, you uncover their goals and tell them how you can help them achieve the goals using personalized conversations and relevant content. This is the phase that helps you be a trusted advisor. In this phase, you need to tailor presentations and sales emails according to the buyer’s persona and the stage of the buyer’s journey. This means that you align your product/service value with the buyer’s needs. You can also use the terminology that the buyers relate to for making them understand how only you can help them reach their goals. Next, you work with the buyer to develop the purchase timeline and then transfer the knowledge to the post-sales team. This isn’t all, you as a part of the inbound sales team need to also check with the buyers after the sale to ensure the continued success and to maintain relationships. In the modern age, your sales efforts need to match your marketing efforts and fulfill your buyer’s needs. Interested in getting starting with the inbound sales process through sales enablement? Connect with our inbound sales experts!